Many people underestimate how much there is to do while visiting Arashiyama. We were lucky enough to book off an entire day here to explore, but I think if we could have done it all over again, we would have booked a hotel to extend our time there. One of the attractions that often gets overlooked by those who only think that the Bamboo Grove is all there is to see is the Iwatayama Monkey Park. Many people are dissuaded when they see that it's a 30 minute to 1-hour hike, uphill, to where you'll see the monkeys. They either can't spare the time or can't spare the energy. But let me tell you right now - it's worth it...well worth it. If you're going to come all the way to Japan, don't be put off by a little walk. The Iwatayama Monkey park is located right across from the Hozu River and is marked with some bright red torii gates sitting on the forest edge. The best way to access the park is from Hankyu Arashiyama Station. From here it's just a 5-minute walk up to the entrance. If arriving from JR Saga-Arashiyama Station, the walk is only 15 minutes and you get to see a lot of the village along the way. Before you approach the ticketing gate, be sure to stop at the Ichitanimunakata Shrine. This shrine is from the Taiho period (701-704) and may be one of the oldest shrines you see on your travels. There aren't many signs or information about it, but it's worth stopping for a moment on your way in or out to admire the ancient designs. Next, you'll turn and make your way to the ticketing booth. Here you pay the admission and hand over any bags that the monkeys might be able to steal before heading up the mountain. Luckily our knapsacks were acceptable, and we were able to head right on up. After paying you are handed some cards with the instructions on how not to interact with the monkeys. I have to say, these instructions freaked me out, but we'd already paid and seeing as I hadn't read anything about people being mauled to death recently, we started to hike up the hill. The trek was harder than I had imagined it to be. But the weather was pleasant, and it was a nice way to get a little bit of exercise and work off one of the many bowls of ramen we'd consumed already on this trip. I think it took us about 35 minutes after stopping a few times for some water. We were glad to have good walking shoes and something to drink with us since there were no places to get beverages until at the top of the hill - where there was, of course, a vending machine. As we climbed higher and higher the landscape changed, trees became more sparse, and soon we heard the first call of a monkey somewhere off in the distance, hidden amongst the trees. 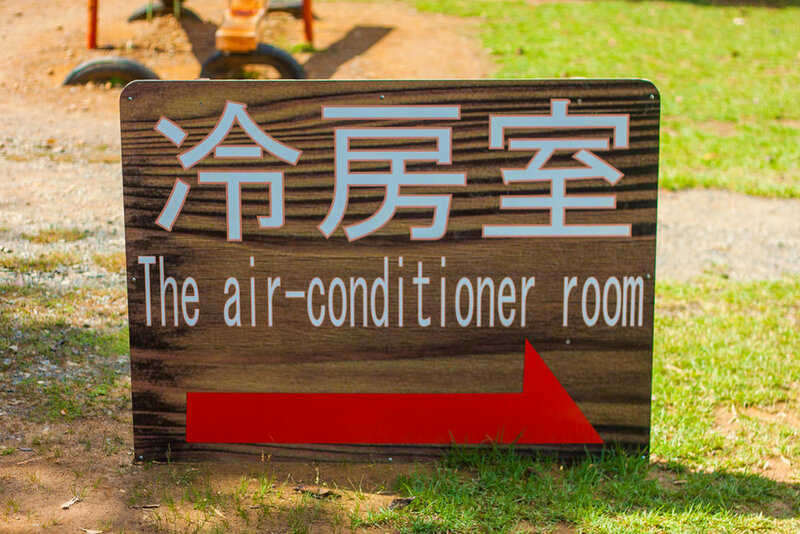 Although it wasn't too warm when we hiked, on sunny days in the summer it must get so hot on your way up, so the air conditioning room would, I'm sure, be an oasis in the tropical forest. There were also several fans (if you can believe it) stuck in the middle of the woods where you could take a break and get some cold air. As soon as we got to the top, over 160 meters above sea level, we were rewarded with an incredible view that overlooked what felt like the entire world. But in reality was the city of Arashiyama, Kyoto, the Kyoto mountains and the Hozu River. There were several binoculars to look down on the city from up here but we were here to see the monkeys! The monkeys running around the top of this mountain are Japanese Macaques or “Snow Monkeys.” They get their name because up here in the mountains during the winter; snow will cover the ground. No other nonhuman primate lives in a colder climate. They were much bigger than I had previously imagined and cruised around the tourists like it was nothing. I did my best to avoid eye contact with them, quickly looking away if one happened to glance up up at me. Different caretakers and anthropologists were stationed up here to look after the monkeys and ensure no one is disobeying the rules. They also track their habits, breeding and life span to learn more about these creatures and how to help their population all over Japan. It was a little scary to see such wild animals so close. They were totally free, and a few of them would get into screaming matched with each other - displaying the strength and aggression to the females. After a little while, you got more comfortable with the animals, seeing as they didn't seem interested in biting your head off. I watched them play, sleep and pick bugs off each other for a snack. Some seemed to have their own groups, some kept to themselves. Just like us! Inside the small building at the top of the mountain are refreshments for humans and treats for the monkeys. You're only allowed to feed them inside this fenced shed area to ensure they're not eating unauthorized food. We bought a few bags of peanuts and bananas and fed the greedy little monkeys. Each one of them fighting over a few nuts. Their little hands and faces were so human like. Watching them meticulously peel the peanuts was fascinating. It was a gentle reminder of how close we really are to them. After feeding the monkeys and taking a water break from inside the water bottle-proof shed, we headed back outside and explored the upper and lower levels of the monkey viewing area. Once you started to look, monkeys seemed to be hiding everywhere. I overheard one of the employees saying that there were over 200 monkeys in this area alone! We took a moment on the bench to enjoy both the monkeys around us but also the views, not only of the city but of the forest. Although the view of the city is stunning, the view of the lush, undisturbed forest was even more interesting. It was so dense and bright green. With so many monkeys up here, I could only imagine how many monkeys made that enormous forest their home. Seeing as there were thousands of people who come to visit the Bamboo Groves of Arashiyama every day it was shocking to see such a small turnout of travellers here at the top of all things. We didn't mind at all though. More monkeys for us. We walked around a little more. Pointing out our favourite monkeys and skittering away from the bigger, scarier ones. Finally, we gathered our strength to make the journey back down the hill. The way down wasn't as hard as the way up but seeing as we only had walking shoes (not hiking boots) some of the slipperier parts of the hill proved a little difficult. Nonetheless, we made it back down in one piece! Although the hike and the time it will take might seem steep (both literally and figuratively) - this trek is worth the time and effort. You'll rarely have such a unique opportunities to see such creatures so close up in the wild as well as get the incredible views the top of this mountain offers. Souvenirs and ice cream cones can be found all over Japan, this is a once in a lifetime experience. Older PostYour Ultimate Guide to Exploring the Village of Arashiyama: What to See, Buy and Eat!